Order a custom-made natural fiber Waldorf doll sewn with love by Joy Chambers. Choose from 13 different dolls! The doll shown above is an example of just one of the available choices. 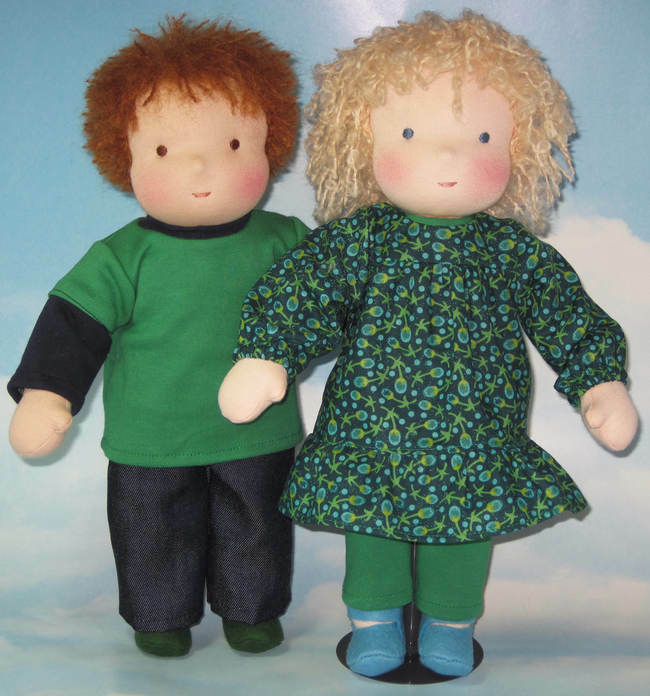 For pictures and detailed descriptions of all dolls please visit the Joy's Waldorf Dolls Pattern section of our website. All little darlings come clothed - you choose the skin tone, hair color, hair yarn, hair style, eye color, nose style, and clothing. Dolls can be shipped worldwide. Normal delivery time in the United States is 2-3 weeks. Please note, extra time is needed in October and November. Orders placed during November and December may not arrive in time for Christmas. Joy will communicate with you directly regarding the making of your customized doll and delivery time. Pricing includes the clothing. Shipping charges are additional. Please, use the contact form below for questions or to submit a customized doll order.